Debates over the legitimacy of racecar-driving as a "real" sport aside, there's one sport we never get tired of playing: mouthing off, a pastime NASCAR leverages in the ads for its Busch Series races. To add texture to this most stimulating of face-offs, the ad-splattered organization features talking heads on ad tees. Iron-on drivers trash each other, make fun of their over-the-hill future selves and call out sluggish competitors. Credited to BooneOakley, the campaign will run on ABC, ESPN and ESPN2, FOX and SPEED, as well as during the Nextel Cup races. Prints and Internet banners will also be floating around in NASCAR-oriented publications and sites. The ads are compelling enough to inspire us to buy a NASCAR shirt, though we'd be bummed if we stood around waiting for them to talk and they just ... didn't. For the buzzkills who respond to trash-talk with "WTF, mate? Got something to prove?! ", NASCAR prepares the perfect slogan: Hell yeah, fucktard! "We've got something to prove." We added the first part, but we know that's what they meant. 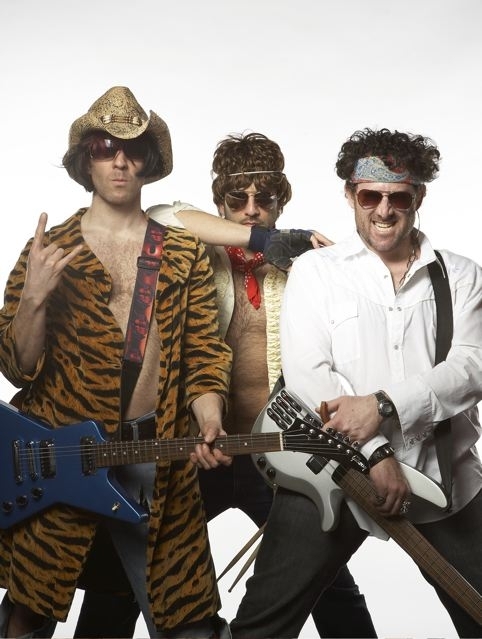 Complete with full blown faux rock band returning after a 25 year absence, behind the scenes-style video and a "hit single," the folks over at ihaveanidea are promoting their upcoming Portfolio Night in style. The band, Burn Back, was popular back in the day but disappeared because they "weren't getting enough respect." Now, they're back to help push the organization's annual world-wide portfolio review during which top creative directors the word over will review the portfolios of aspiring creatives eager to get into advertising. It all happens May 3rd in 28 cities across the globe. Get your portfolios ready people! In early March, Hyundai began accepting applications for its Mash and Seek Challenge, a game somewhat similar to a game developed for Budget car rental, which will, on April 30, place 16 finalists in teams of four with a single photograph mashed up with the faces of the team members. The first team to find another will win four 200y Hyundai Elantras. Quizes will be administered every two weeks and those that answer correctly will be given clues to the location of other teams. Check it all out here. Apparently even movies want in on CGM. Paramount gets together with Eyespot to push a video mash-up contest for the Disney-fied Rear Window-esque film Disturbia starring Shia LaBeouf. The promotions put heat on how well you know your neighbors and encourages a sensory mix of audio, visual effects and whatever else you can weave out of Final Cut Pro. Contest winners get an Xbox 360 because everybody already has an iPod and only spammy banners give iPhones away. Fuel Industries Introduces Ideal Mode of Transport. It's Customizable Too! This is kind of cute. To promote the DVD release of Eragon, Fuel Industries put together Volksdragon, a fun little site where you can customize your very own dragon. It's a little like modding a Scion but less ugly and possibly more maintenance (what fuels dragons, anyway? Us?). Minor upkeep concerns aside, the idea of travelling by dragon is extremely appealing. Show us something cooler than harnessing a dragon, and we'll show you a liar. Off-topic, Fuel Industries seems very fond of car themes. If any of you ladies in the industry would like to leave behind demanding clients, whining account executives, pompous creative directors and groping bosses who only see you for your mini-skirted long legs and button-straining cleavage, now's your chance. GoDaddy is in search of another GoDaddy girl. If you win the contest, you can leave behind all that rampant sexism and be appreciated by Bob Parsons and the rest of the Godaddy folk for your important assets...like your mini-skirted long legs and button-straining cleavage. Sweet deal, huh? You can prance around in tight tops while drooling film crew members spray you with water until the cold causes your breasts to offer up that quintessential reaction so many admire yet causes nothing but embarrassment for you. Sit next to Bob during interviews as he tries not to leer at you while asking you important questions about your background and decision to become a GoDaddy Girl. And, screw working on a Super Bowl commercial. Appear in one instead so 50 million American men can fantasize about you when they go to bed at night, Or to the bathroom after the commercial break. Sounds like a great career move. What are you all waiting for? UPDATE: Actually, screw GoDaddy. Let's have an Adrants Advertising Hottie Contest. Sure it's sexist but it's also fun. Guys are welcome too. We'll think of a good prize. Put your submissions in Comments or send using the Contact link at the top of the site. - The MyPetFat guy is giving away free pet fat to the first 50 people who guess the "secret of the scale." - Global product placement grew 37 percent in 2006 and is predicted to grow 30 percent in 2007 according to a PQ Media study. - Fast Company magazine has just announced that its ad pages increased 9.1% in the first quarter of 2007 compared to the same period one year ago, according to The Publishers Information Bureau. - San Francisco's BART has hopped on the subway tunnel advertising train. 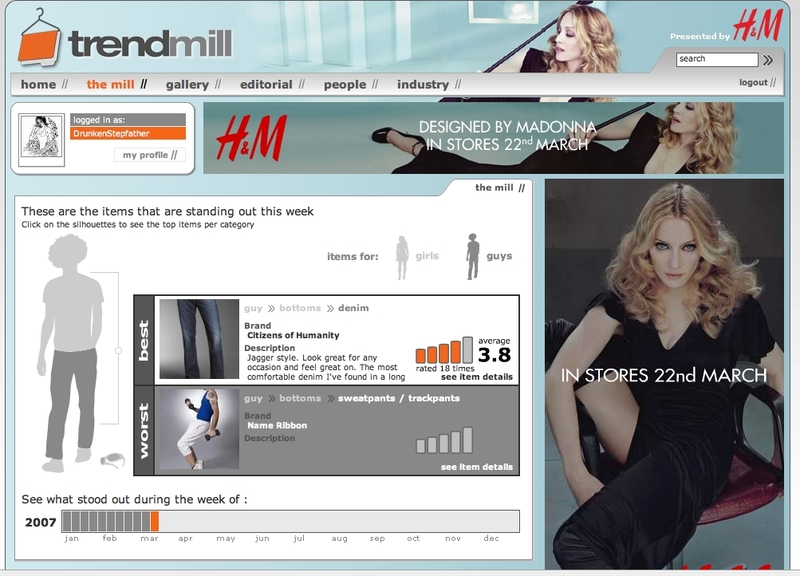 - Madonna and H&M are together again on fashion networking site Trendmill. - Travelocity's Traveling Gnome now has his own MySpace page. Tila will be sending a friend request any minute now. - Riddle Productions has created a new game for MTV.com called Daily Rage will will incorporate brands into the actual game play. Dare we say watching a woman stripping in a YouTube video is becoming a bore? It may be but since the readers of Adrants voted Anna, the woman who reads from the new book, Punk Marketing, while taking her clothes off to be hotter than Cleo, the other woman who did the same thing for the book, we thought it would be a disservice not to give you more of what you want. So, here she is for a second time; Anna stripping while reading Punk Marketing.